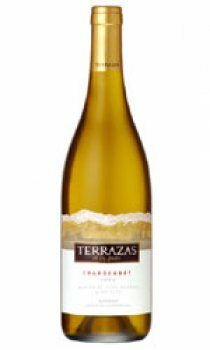 At 1200 metres (3900 feet) above sea level in Mendoza, the Terrazas de los Andes Chardonnay vineyards are found nestled at the foothills of the Andes mountains. A unique combination of altitude, dry soils, sunny climate and cool breezes from the Andes allow the Chardonnay grape to become its most expressive. Yellow with hints of green. Clear citric notes, fresh peaches, and tropical traces of coconut and pineapple. Light trails of vanilla and caramel left by the oak ageing. Medium bodied, round and soft, intense, yet easy to drink. Reveals a fresh acidity and persistent aromas in the mouth. Enjoy it with fish, seafood, poultry and pasta dishes with soft sauces. Serve between 8 and 12 degrees celsius.